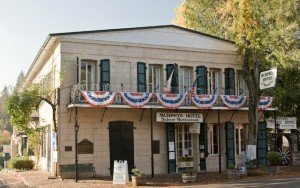 The Historic Murphys Hotel stands grandly on Main Street, anchoring the thriving foothills town to its original Gold Rush roots as it continues its 155-year service as a hotel, restaurant, saloon and meeting place for Calaveras travelers and residents alike. The hotel was opened in 1856 and was originally dubbed “Sperry and Perry Hotel” and was one of the original 100 Wells Fargo stops. During its early years the hotel lodged world travelers en route to the astonishing attractions the foothills offered, such as Calaveras Big Trees Park and Mercer Caverns, as well as those seeking fortune and adventure at the onset of the great Gold Rush. Some of the historic luminaries to grace its halls : Mark Twain, Horatio Algiers Jr., John Jacob Astor, Thomas J. Lipton, J.P. Morgan, and former President Ulysses S. Grant. In the ’60s, the hotel was purchased by a group of former University of the Pacific students who would, beginning in their college years, descend upon the hotel as members of the informal “Murphys Ale and Quail Club”. Two additional wings were built and, in 1978, it was added to the National Register of Historic Places. The hotel is now owned by long-time Calaveras resident Dorian Faught, who has begun to meticulously restore and improve the already fantastically well-maintained property in hopes to continue another century and a half of service as the Mother Lode’s crown jewel. Murphys Hotel is the only hotel on historic Main Street, as well as the only hotel offering full restaurant and bar service seven days a week to its patrons. While the traditional dinner house offers award-winning fare such as prime rib, rack of lamb and fried chicken in two lovely dining rooms or even on the patio under the gorgeous trees overlooking Main Street, the old saloon serves up its hearty pubgrub offerings to its patrons on the original bar (made up of one whole thirty-foot plank in place since its 1856 opening) as they warm themselves next to the pottybelly stove. Whether you’re staying at the hotel for a night, nibbling on bread pudding (with whiskey sauce!) or downing a pint after giving the grilled alligator a try in the saloon, it’s truly an experience unique to Murphys. History, food, wine, company and community — it’s what Murphys does best.